Smooth this nourishing body lotion, infused with hydrating macadamia and kukui nut oils, onto your skin and let the tranquility of the tropics dissolve your thoughts away. Our Island Bath & Body Plumeria Vanilla Body Lotion is made in Hawaii and contains beneficial aloe vera gel and extracts from healing sources like the papaya, hibiscus, Pacific sea kelp, white ginger, and ginger root. Additionally includes vitamins A, E, and D and moisturizing coconut oil. This Hawaiian product is the perfect reminder of your island vacation or give it as a gift of aloha! *Returns accepted only for defective items. 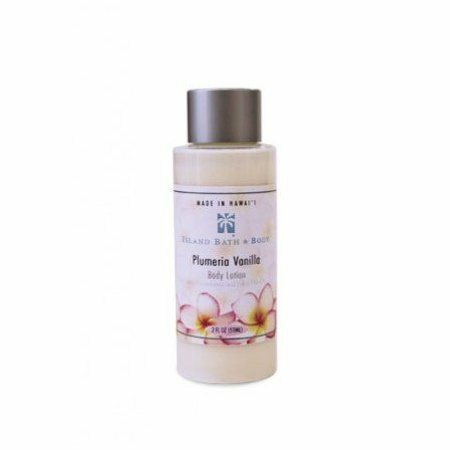 Purchased Item: Island Bath & Body Body Lotion [Plumeria Vanilla] 2 FL OZ.